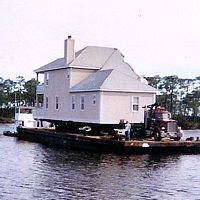 Clay Fauver's House Movers & Leveling Co., Inc. - We specialize in . . .
lifting and shoring structures . . .
Service area - we work within 300 miles of Mobile, in Alabama and Mississippi. For an estimate on moving a structure be prepared to answer the questions on the worksheet here. (new window will open). We are house lifters - elevating, lifting, raising, and shoring is what we do.